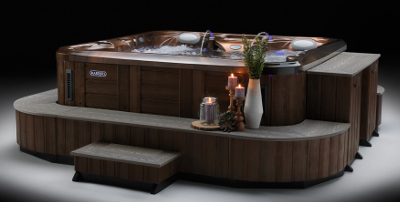 Marquis portable hot tubs are designed to provide you with The premium Hot Tub Experience! Aside from refined beauty, each spa features advanced hydrotherapy and powerful performance. Whether you want all the unique features imaginable, or want to include the specific features you desire, you're sure to discover the perfect portable hot tub to fit your individual lifestyle! Come in to our showroom and see the swim spa that resulted from a collaboration with Dave Scott, 6 time Ironman World Champion, excellent for training and rehabilitation. The ATV-14 is 14 feet of aquatic activity and enjoyment! Designed to fit into a relatively smaller area, the ATV-14 does not skimp on features or benefits. 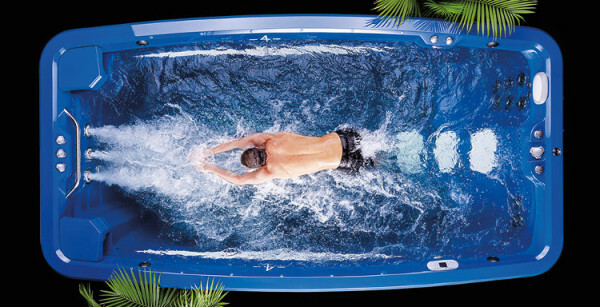 With a true four foot of water depth you can stand up submerged in water and exercise away! Anyone will get the workout they desire with ample height and wingspan area. Butterfly, breast stroke or freestyle your way to fitness! Plus the ATV-14 will look great in your home. The synthetic wood exterior is the best in the industry and the optional matching exterior steps will create a beautiful focal point in your yard. Discover how to improve your healthy performance and elevate your swim spa experience with an Aquatic Training Vessel by Marquis® today!